We’d love your help. Let us know what’s wrong with this preview of Fractal Space by Thane Keller. Brokk is the chosen one. His golden skin proves it, his supreme leader has given him the warships, and the dead have accepted his sacrifice. With an armada of battleships and forty million soldiers, Brokk will be chancellor of the Tassian system by nightfall. Even the best of plans can come unraveled, and for Brokk, the desperate moves of a vagrant named Casika risks destr Brokk is the chosen one. His golden skin proves it, his supreme leader has given him the warships, and the dead have accepted his sacrifice. With an armada of battleships and forty million soldiers, Brokk will be chancellor of the Tassian system by nightfall. Even the best of plans can come unraveled, and for Brokk, the desperate moves of a vagrant named Casika risks destroying everything he set in motion. 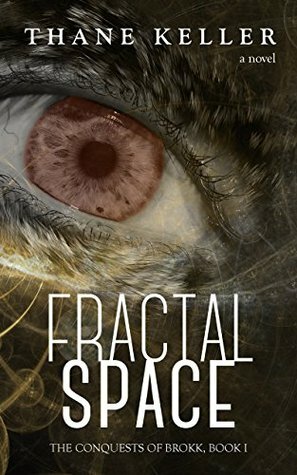 To ask other readers questions about Fractal Space, please sign up. Because of something that happened 4,000 years ago, one planet takes over another with the aim of exterminating all of the occupants. One young girl from the conquered planet escapes, finding another alien race. After that we get a standard resistance/war novel with space ships. This was a fast paced space adventure. I enjoyed it quite a bit. There are three different species involved in this story and the author did a great job of giving us a quick look at each. It was super intriguing to me, I would read a novel about each of those races. I will be continuing this series, which should tell a potential reader what they need to know. As I stated above a great start and excited to read more. Good military SciFi with a nice story line. This is the first of a trilogy, but can stand on its own although it is obvious at the end the author is setting you up for the next book. Lots of fighting and strategy. Recommended. I enjoyed the author's writing style. Sometimes books can sound juvenile and unedited, but that was not the case here. The writing was professional, but still casual enough that it allowed you to read with ease. This novel was on the shorter side, which I thought was perfect for the plot. The world building was done very well, and it seemed to be very thought out. I enjoyed reading about the various alien races that the author had created, especially since the Jarks weren't as humanoid as alien sp I enjoyed the author's writing style. Sometimes books can sound juvenile and unedited, but that was not the case here. The writing was professional, but still casual enough that it allowed you to read with ease. The world building was done very well, and it seemed to be very thought out. I enjoyed reading about the various alien races that the author had created, especially since the Jarks weren't as humanoid as alien species often tend to be. There wasn't a subplot in this book, which is likely a good thing, as it let the plot continue at a steady pace. The author did, however, alternate character perspectives. This kept my interest. I would become very involved in one character's side of the story, but all of a sudden the perspective would switch. After a moment of thinking longingly about the last perspective, I would get really into the new character, and then the process would repeat. It certainly served to keep me reading. I also found myself to be very interested in the relationships between characters. As for the plot itself, I enjoyed it. It wasn't a genre or style that I normally read, but I wanted to branch out. A lot of the novel is battle scenes, and considering the author's background, I knew that the way the characters were feeling was true to life. I also felt assured that the author knew what he was talking about, which made information that I would otherwise have not cared about, interesting. I found the technology in this world to be futuristic, yet believable. Overall, I thought that the story and world was well-developed and well thought out. I enjoyed the characters and was interested in how their relationships would develop. My interest in the battle scenes waxed and waned, but if you're fond of action scenes you'd definitely enjoy this. I found myself rooting for the tyrant. Not a likable character, but I wanted Brok to succeed. Fine writing by the author. Headed to book two now. Well written with excellent character development and a firm plot. More action than expected. Although free it would be worth buying. Thane is a graduate of the Virginia Military Institute with a degree in psychology and a minor in English. Following college, Thane married his high school sweetheart Sarah and started his career as a cavalryman in the United States Army. Over the course of his career, he has deployed to both Iraq and Afghanistan where he was personally engaged in ground combat. His service has thus far earned him Thane is a graduate of the Virginia Military Institute with a degree in psychology and a minor in English. Following college, Thane married his high school sweetheart Sarah and started his career as a cavalryman in the United States Army. Over the course of his career, he has deployed to both Iraq and Afghanistan where he was personally engaged in ground combat. His service has thus far earned him two Bronze Stars and numerous other awards and decorations.